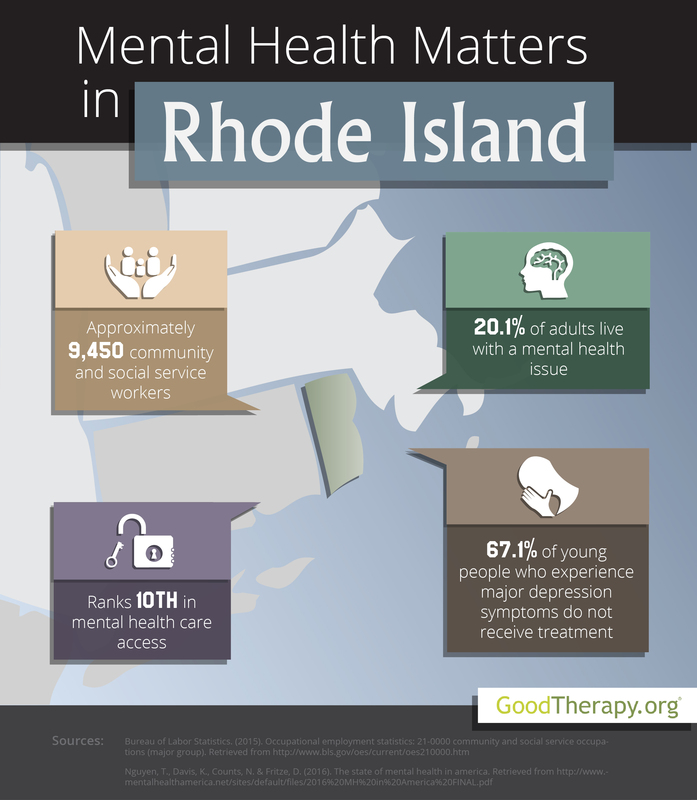 Find a therapist in Rhode Island with GoodTherapy.org. More than 1 million individuals lived in Rhode Island in 2015. About 9,450 residents were employed in community and social service occupations in the same year. Common jobs within this field included working at a residential treatment center as a therapist, addiction counselors, certain categories of religious work, and licensed clinical social workers. In the 2016 Mental Health America (MHA) survey, which examines the state of mental health across the country, the state of Rhode Island was 42nd in adult ranking, 34th in youth ranking, 50th in prevalence of behavioral and mental health issues, and 10th in access to professional mental health services. Mental, emotional, and behavioral issues tend to affect a relatively high percentage of residents in both the adult and youth populations. At 20.1%, Rhode Island is ranked 44th for adults with adverse mental conditions. Substance abuse and suicidal ideation are significant concerns for therapists in Rhode Island, with 11.2% and 4.3% of the adult population affected respectively. The state ranked a low 50th and 42nd in these respective measures. Young people in Rhode Island also experience a high prevalence of drug and alcohol issues. According to the Substance Abuse and Mental Health Services Administration (SAMHSA), in 2012-2013 Rhode Island had a higher percentage of adolescents who were engaged in drug use, drug dependence, alcohol dependence, and binge alcohol use than the respective national averages. In the 2016 MHA survey, the state was ranked 42nd for young people who experience drug or alcohol issues, 48th for young people with episodes of major depression in the past year, and 48th for young people with severe clinical depression symptoms. Despite the presence of these adverse issues, Rhode Island is among the top 10 states in providing easy access to mental health care. The state has the third-lowest percentage of children with private insurance that does not have mental health coverage, and is ranked 7th in mental health workforce availability. The ratio of residents to mental health providers in Rhode Island is 298:1.